The chipmunk is a member of the rodent family who can live to be 8 years of age, though average lifespan is between two and three years. During this time, an adult female typically produces between 20 and 30 offspring, depending on how abundant food supplies are. There are 25 different species of chipmunk, though all share similar development life cycles. Chipmunks are native to North America. With the exception of the Asia's Tamias sibiricus, all other varieties can be found from Southern Canada to Northern Mexico. Female chipmunks typically breed in early summer and early fall. The female mates repeatedly during an estrus period that last six or seven hours. She has an average litter of between four and six pups. Baby chipmunks are born blind and without fur, measuring a scant 2 or 3 inches. The babies are born and reared in an underground burrow and are tended to by their mother. The pups begin to grow fur during the second week of life and start to develop signature markings by the third and fourth weeks. They open their eyes when they’re a month old, and venture out of their underground burrow for the first time around 40 days old. The mother chipmunk begins to wean her young when they emerge from the burrow, and the pups are typically on their own within a few weeks. The mother may move her weaned pups to a different burrow or leave the nest and create a new home for herself. The weaned young won’t usually remain together, with the litter mates each going off in their own direction. Chipmunks are fully developed within seven to nine months, at which point they range from 7 to 10 inches long and have a bushy tail. 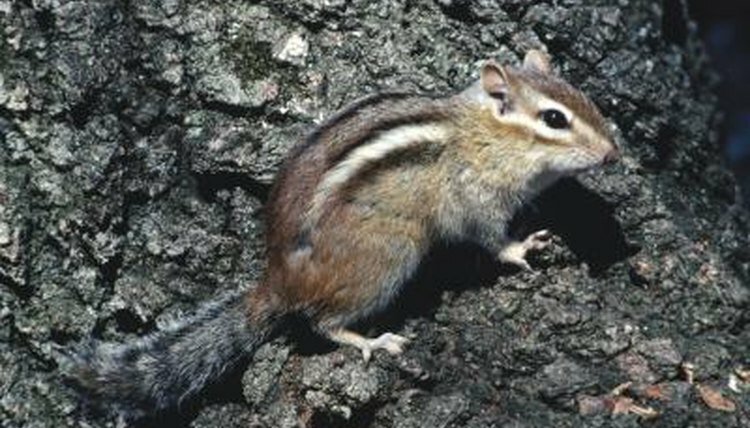 An adult chipmunk is characterized by gray, rust, tan or brown fur, a white belly, black back stripes and white stripes near its eyes. The chipmunk reaches sexual maturity by the time it’s a year old, and may have a territory as large as an acre. They’ll defend their turf as adults through loud vocalization, chases and fights, especially during mating season. Chipmunks mate more frequently and have larger litters when food supplies are plentiful. Chipmunks consume a diet comprised primarily of nuts, fruits and seeds. Not complete herbivores, chipmunks will sometimes eat newly hatched birds as well. Weather and living conditions also can impact development, as long winters can result in smaller litter sizes and less frequent breeding.